I had raised suspicion about Councillor Wong-Tam's call for a review of cycle tracks and dealing with Wheel-Trans, emergency vehicles and that it would start poking holes into the protected bike lanes all over the network. 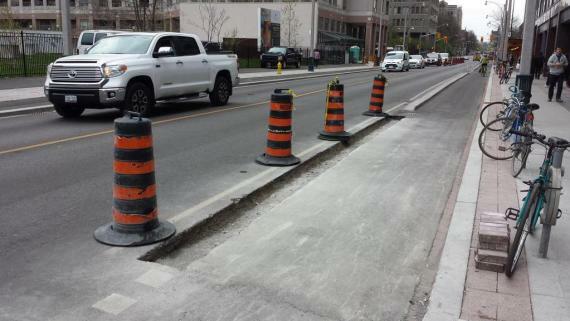 It turned out that the review was completely unnecessary since Cycling staff are quite willing to remove a cycle track curb in front of 24 Wellesley without full public consultation. It's clearly important that Wheel-Trans and EMS be able to access the building. EMS can always jump any curb but Wheel-Trans needs a place to load/offload wheelchairs so they needed someplace flat. Stopping in the car lane on Wellesley was an option—a typical Wheel-Trans stop lasts 7 minutes. Another option is one of the three laneways around 24 Wellesley, though staff seemed to only have considered one of the laneways and determined it was too narrow. Yet another option was to raise the cycle track bed much like is done at bus stops on Sherbourne, but staff stated there was a problem with drainage. So it seems that given the choice between blocking the car lane versus blocking the protected bike lane, access for a car driver wins out over access and safety for a cyclist. Jacquelyn Hayward Gulati, the new Cycling Unit manager, states that the "adjacent vehicle lane will be narrowed so cyclists can ride around a Wheel-Trans vehicle without entering traffic." It's a substandard solution since cyclists have still lost the curb separating them from motorized traffic. Gulati claims that “the site-specific access concern really impacted the people who lived in that building, while the impact on cyclists is very minor." We don't have any idea of what Gulati is comparing here: is it access for residents versus safety and comfort of cyclists? I would hope the City staff would try a bit harder so they don't have to trade these off. Councillor Wong-Tam claims she didn't know about the removal, but surely she must have received complaints from residents and have heard from staff. Perhaps she knew all about the issue but didn't know cycling staff were going to go ahead with the removal before public consultation in the summer. 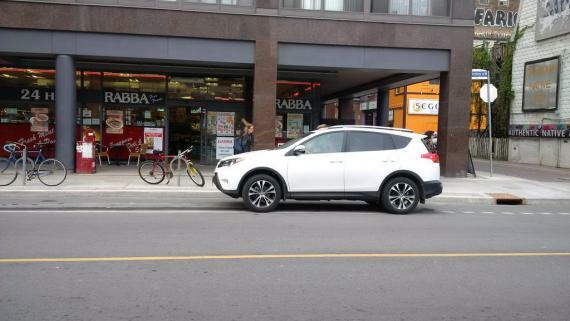 Regardless, this is a bad precedence for safe cycling infrastructure in Toronto. I'm sure we'll hear about more calls by businesses, residents to remove cycle tracks. It takes years of public consultation to get safe cycling infrastructure but mere weeks of no public consultation to rip them out. Raising the cycle track in this location could be a solution that works for everyone - the problem is that staff will need to think outside the box to handle the drainage. But they won't deviate from their current procedures of doing drainage unless the local Councillor puts pressure. So I'd suggest everyone who is reading this to call Wong-Tam's office. 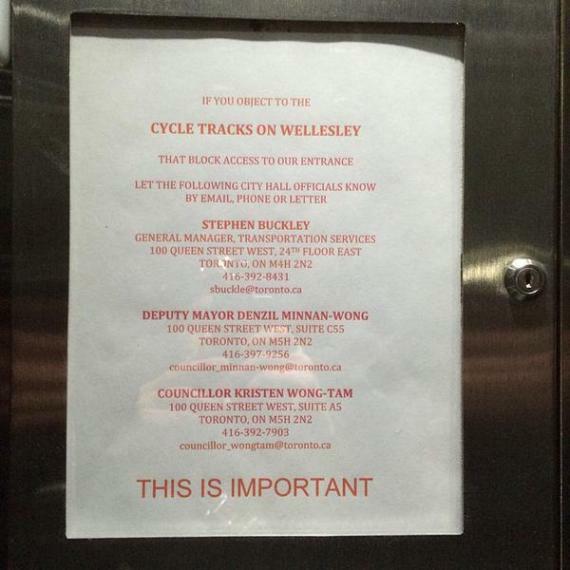 You can say that you no longer feel safe cycling past 24 Wellesley and an alternative solution should be found.